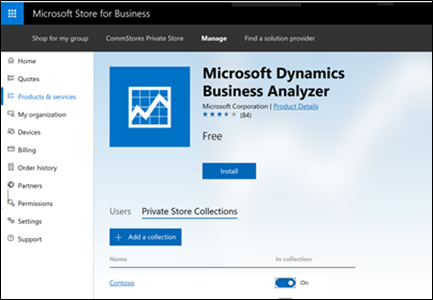 The private store is a feature in Microsoft Store for Business and Education that organizations receive during the sign up process. When admins add apps to the private store, all people in the organization can view and download the apps. Only online-licensed apps can be distributed from your private store. 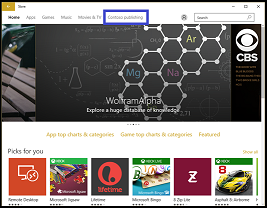 The name of your private store is shown on a tab in Microsoft Store app, or on Microsoft Store for Business, or Microsoft Store for Education. You can change the name of your private store in Microsoft Store. In the Private store section, click Change. Type a new display name for your private store, and click Save. You can create collections of apps within your private store. Collections allow you to group or categorize apps - you might want a group of apps for different job functions in your company, or classes in your school. You can add a collection to your private store from the private store, or from the details page for an app. Type a name for your collection, and then click Next. Add at least one product to your collection, and then click Done. You can search for apps and refine results based on the source of the app, or the supported devices. New collections require at least one app, or they will not be created. Click Manage, and then click Products & services. Under Apps & software, choose an app you want to include in a new collection. Under Private Store Collections, click Add a collection. Add at least one product to your collection, and then click Done. Currently, changes to collections will generally show within minutes in the Microsoft Store app on Windows 10. In some cases, it may take up an hour. If you've already added a Collection to your private store, you can easily add and remove products, or rename the collection. Click the ellipses next to the collection name, and click Edit collection. Add or remove products from the collection, and then click Done. You can also add an app to a collection from the app details page. Under Private Store Collections, turn on the collection you want to add the app to. We've recently made performance improvements for changes in the private store. This table includes common actions, and the current estimate for amount of time required for the change. - Apps recently added to your inventory, including line-of-business (LOB) apps and new purchases, will take up to 36 hours to add to the private store. That time begins when the product is purchased, or added to your inventory.